Who doesn’t love summer? It’s a time of family gatherings and picnics, yearly vacations and lounging in the shade on hot afternoons. Those warm summer days are also a great time to help your kids develop an appreciation for nature and stretch their imaginations, too. 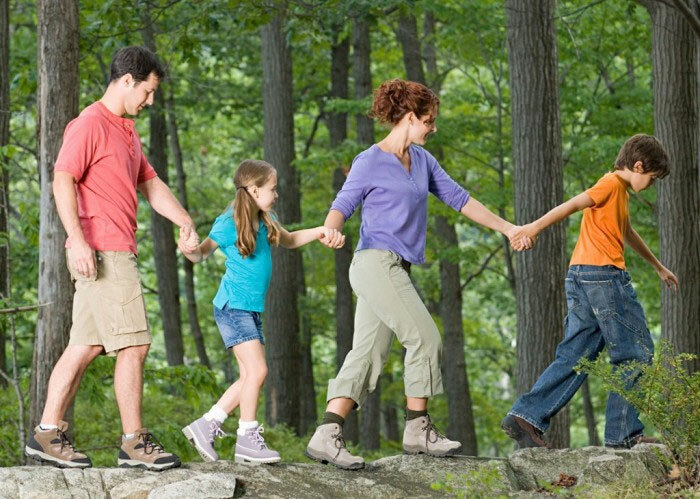 Below are five easy outdoor activities the whole family can enjoy now and through summer. Geocaching: Treasure hunt meets technology. Using a GPS device, kids can go online and find coordinates that will take them to different caches hidden all across the United States. By selecting one nearest to you, kids then use GPS to discover hidden containers filled with various “geocaches”–often a log book that kids can sign and a goodie to exchange. The rule is this simple: “If you take an item, leave an item, and sign the log book.” Want to make your trip an environmental awareness event? Collect trash on the trails as you search for the hidden booty. Learn more at http://www.geocaching.com/. Picture Walk: Nature photography without the hype. Given how easy it is to use a digital camera, even the ones on cell phones, why not take a walk with your around the neighborhood, snapping pictures? Encourage them to tell a story about what they see or to focus on particular colors or elements of nature, like trees or animals. Then, take the camera hard drive to a store, print them, and assemble them in a flip book that can be revisited in the colder winter months, too. Micro-Gardening: Edible rewards for minimal effort. Don’t have time for a full-blown garden? That’s okay. Sprout a micro-garden of different lettuces and herbs in an indoor pot and then move it outside to enjoy. Varieties like Romaine and Mesclun offer a mild, crunchy alternative to processed snacks, and summery herbs, such as basil and cilantro, just might encourage your kids to join you in the kitchen to cook dinner. Nature Hike: Know your world and name it. Naturalists have long enjoyed the pleasures associated with naming trees and flowers, shrubs and grasses in their respective locations. Discover this same joy and teach your kids to appreciate nature. Outdoor Art: Sunlight as paintbrush. Most craft stores carry sun-sensitive paper, a blue hued canvas for making images and words. Simply put an object on the paper–a leaf, small trinkets from around the house, even paper cut into various shapes–then set the paper in direct sunlight for just a few minutes. Rinse under water. Voila! The shadow of the image turns white and the exposed paper stays blue. Want to make this into a science project? Test various sunscreen strengths, such as a SPF 15 versus an SPF 30, and see what happens. Which one blocks more sun? You can buy sun-sensitive fabric, too. Learn more at http://www.stevespanglerscience.com/product/sun-sensitive-paper. Jen Henderson is a freelance journalist writing about issues of sustainability, health, and weather safety.